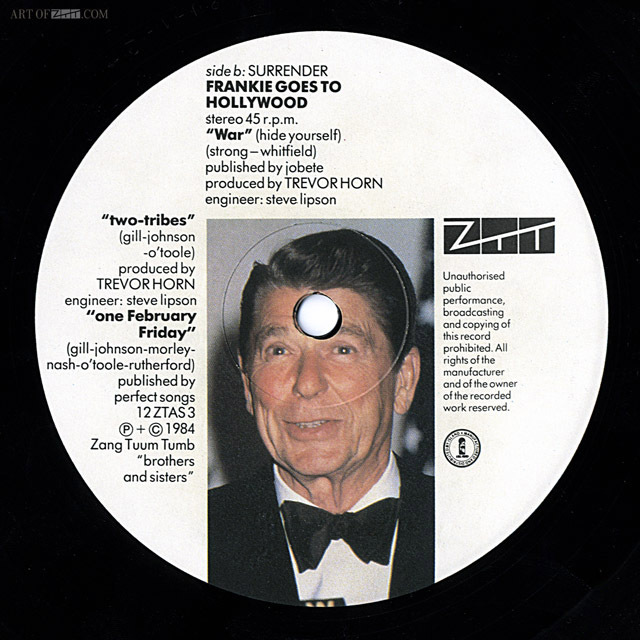 Was a new remix an excuse to write a new set of sleevenotes, a new chapter to the ZTT story? David Smart: “We never paid for any of these (photos of Thatcher and Reagan) Hideous typography though! So did you come up with things like ‘Annihilation’ and Trevor went away and put ‘The air attack warning sounds like’ on it? Paul Morley: “Yeah, at the time there was a lot of things in the air about nuclear bombs and strange ways of protecting yourself and we got hold of the CND… CND had a tape of what we were going to hear if a nuclear bomb was about to hit London and it was this stupid Patrick Allen. And just about everything he says on it is what we would hear over the loudspeakers in London if a nuclear bomb was heading for us. Except for ‘This is the last voice that you will ever hear’. So even the things about putting bodies out on the street and wrapping them up, that was all what we were going to hear, it was quite extraordinary. 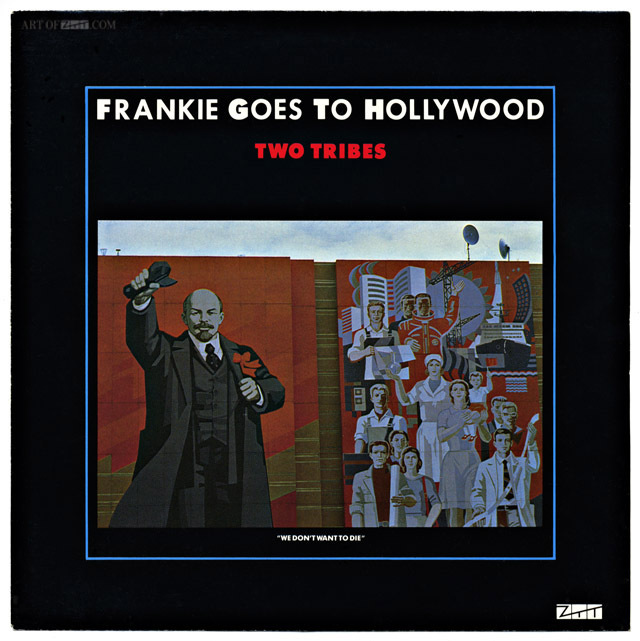 artist: Frankie Goes To Hollywood title: Two Tribes format: 12″ single design: XLZTT photography: Anton Corbijn (front) cat. 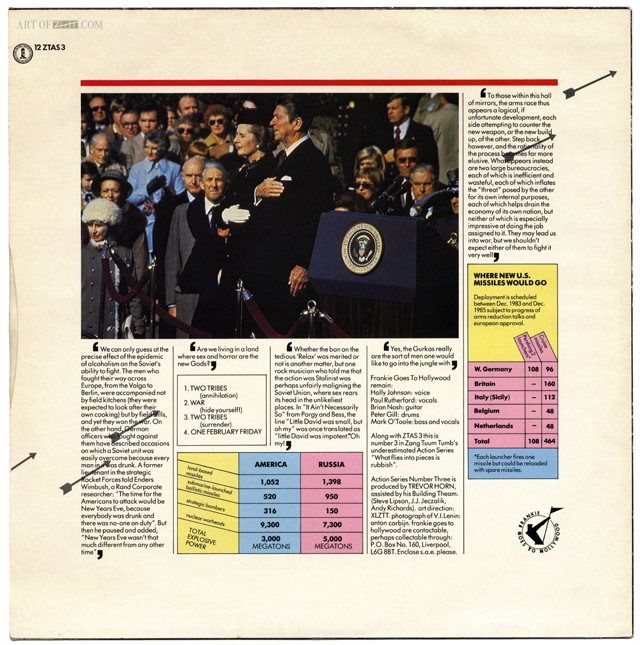 no: 12ZTAS 3 date: 04/06/84 art of notes: The first of several remix 12″s that were released. 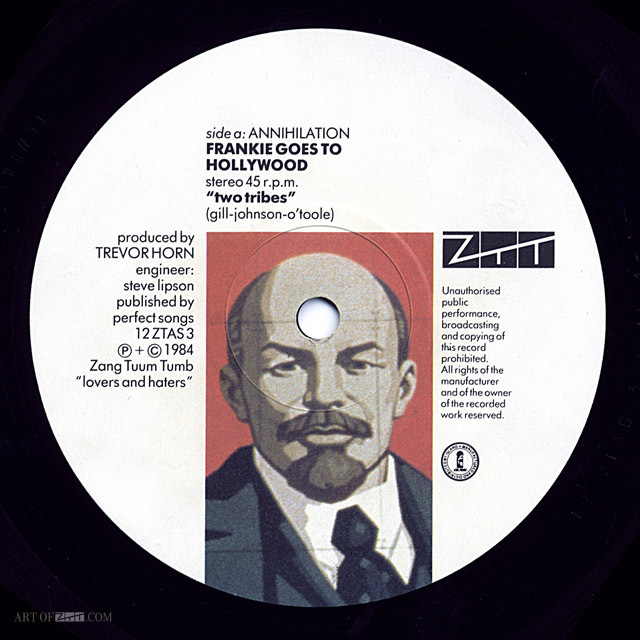 Some copies of this 12″ came with one of three different posters of the band photographed in US and USSR military costume by Eric Watson.